THINK YOU HAVE GOPHERS OR MOLES? 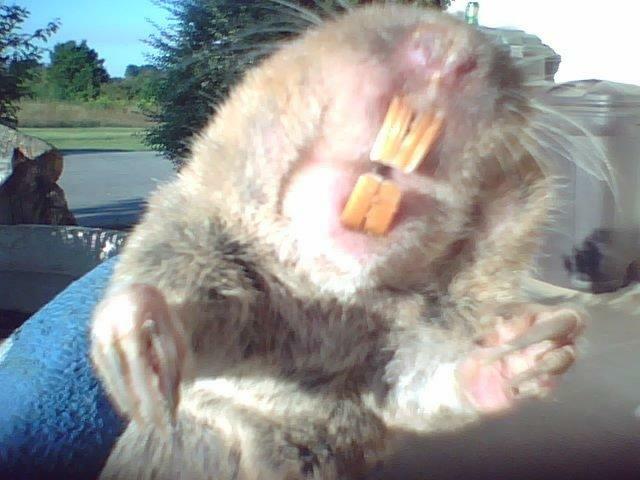 Historically, ridding your property of gophers and moles was accomplished solely through the use of baits and trapping. While this may kill the animal, it failed to do anything to the existing tunnel network created by the burrowing animals. This creates a problem: Leaving the existing tunnel infrastructure in place allows other gophers and moles to continue using these tunnels to access the property again and again. If you want to stop access into the property, the tunnel network must be destroyed. One gopher can create several mounds per day. Mounds appear more often during spring or fall when the soil is moist and easy to dig. In irrigated areas such as lawns, flower beds, and gardens, digging conditions usually are optimal year round and mounds may appear at any time. Gophers don’t hibernate and are active year-round, although you might not see any fresh mounding. They also can be active at all hours of the day. 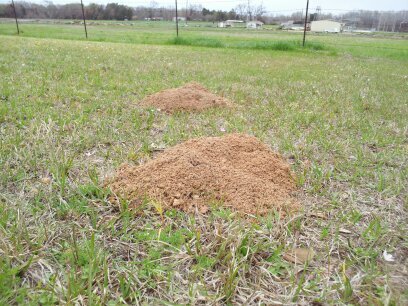 Pocket gophers live in a burrow system that can cover an area that is 200 to 2,000 square feet. The burrows are about 2–1/2 to 3–1/2 inches in diameter. Feeding burrows usually are 6 to 12 inches below ground, and the nest and food storage chamber can be as deep as 6 feet. Gophers seal the openings to the burrow system with earthen plugs. Short, sloping lateral tunnels connect the main burrow system to the surface; gophers create these while pushing dirt to the surface to construct the main tunnel. Gophers usually live alone within their burrow system, except when females are caring for their young or during breeding season. Gopher densities can be as high as 60 or more per acre in irrigated alfalfa fields or in vineyards. Gophers reach sexual maturity about 1 year of age and can live up to 3 years. In nonirrigated areas, breeding usually occurs in late winter and early spring, resulting in 1 litter per year; in irrigated sites, gophers can produce up to 3 litters per year. Litters usually average 5 to 6 young. Pocket gophers are herbivorous and feed on a wide variety of vegetation but generally prefer herbaceous plants, shrubs, and trees. Gophers use their sense of smell to locate food. Most commonly they feed on roots and fleshy portions of plants they encounter while digging. However, they sometimes feed aboveground, venturing only a body length or so from their tunnel opening. Burrow openings used in this manner are called “feed holes.” You can identify them by the absence of a dirt mound and by a circular band of clipped vegetation around the hole. Gophers also will pull entire plants into their tunnel from below. In snow-covered regions, gophers canfeed on bark several feet up a tree by burrowing through the snow. Pocket gophers often invade yards and gardens, feeding on many garden crops, ornamental plants, vines, shrubs, and trees. A single gopher moving down a garden row can inflict considerable damage in a very short time. 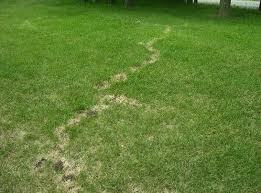 Gophers also gnaw and damage plastic water lines and lawn sprinkler systems. Their tunnels can divert and carry off irrigation water, which leads to soil erosion. Mounds on lawns interfere with mowing equipment and ruin the aesthetics of well-kept turfgrass. Moles are small, insect-eating mammals. Moles live almost entirely underground in a vast network of interconnecting tunnels. They frequently create shallow tunnels just below the surface where they capture worms, insects, and other invertebrates. They can eat some roots, bulbs, and other plant material, but generally the greatest problem caused by moles is their burrowing, which dislodges plants and dries out their roots. In lawn areas, the mounds and ridges resulting from their burrowing are unsightly and disfiguring. 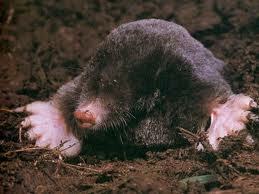 Moles have cylindrical bodies with slender, pointed snouts, and short, bare, or sparsely haired tails. Their limbs are short and spadelike. Their eyes are poorly developed and their ears are not visible. The fur is short, dense, and velvety. Moles have one litter of three or four young during early spring. Mounds and surface runways are obvious indicators of the presence of moles. The mounds are formed when moles push soil up to the surface from underground runways. The excavated soil may be in small chunks, and single mounds often appear in a line over the runway connecting them. Surface feeding burrows appear as ridges that the mole pushes up by forcing its way through the soil. Some of the surface runways are temporary. More permanent tunnels are deeper underground and are usually about 2 inches in diameter and 8 to 12 inches below the surface. Moles are active throughout the year, although surface activity slows or is absent during periods of extreme cold, heat, or drought. Moles burrow all or most of their lives through the soil, looking for food. They eat almost any insect, worm, or bug found in or on the ground. If a mole goesfor more than a few hours without food, it will starve to death. This occurs because, except for a few pauses, it is moving all of the time. It uses much energy and must eat to get more energy. Even at night, a mole does not stop looking for food. It must eat more than its own weight in food each day to stay alive. It eats mostly earthworms but occasionally eats the larvae or adults of insects found in the soil also. Like most moles, it finds its food using its flexible, hairless snout and sensitive whiskers, which can detect the slightest vibration or movement in the soil.Grubs are a favorite food for moles to eat. Moles have few natural enemies and usually die due to accident or disease. Because of their low death rate, eastern moles mate and have one litter of two to six young a year in the spring. The young are born only four to six weeks after mating, and are born blind and hairless. To mate, the male seeks out the female in her burrow, a hollow earth chamber, under a log, stump, or large rock with a floor of dried grass or shredded leaves. The young are born in this nest or onto the dirt floor near it and spend just a few weeks living off their mother's milk before they are able to go off on their own. The young can take care of themselves after a month and can have young of their own in the following spring.